Why could we ban CFC's and fix the ozone layer but struggle with CO2 emissions? Not all to long ago a giant hole was discovered in the ozone layer. The layer that protects us from Ultra Violet light, a wavelength of light that if unfiltered, would cause sunburn in only five minutes and make it impossible to grow our most common commercial crops. 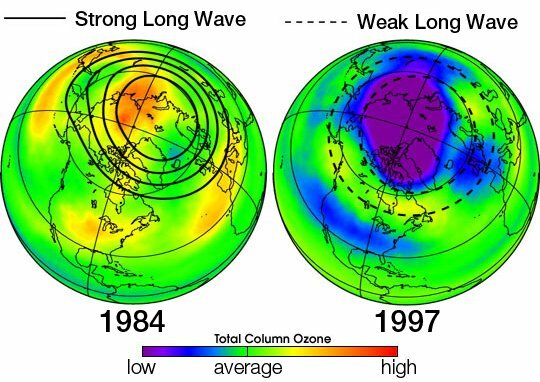 Luckily some smart scientists in the late 70's observed the depletion of ozone in the lower stratosphere (from 20 to 30 km) near the polar regions and sounded the alarm. Actions were taken quickly and in 2015 the hole in the ozone layer was observed to close. in 40 years we managed to take our responsibility and averted an ecological disaster. Luckily we managed to avert a crisis and we must have learned how to solve global ecological problems in the future shouldn't we? Research on global warming and the effect of greenhouse gasses (GHG's) on the climate has began to appear around the same period. Scientists weren't sure if they had to expect global warming or global cooling but in the 90's they became convinced about the warming scenario. There is a really nice website that shows the timeline of climate research which gives a beautiful overview. So why is it that we could ban Chlorofluorocarbons (CFC's) in a few decades but still struggle with convincing people of the effects of greenhouse gasses? Well there are a few reasons for that. I assume you are familiar with the concepts of the depletion of the ozone layer and the workings of greenhouse gasses? If not I kindly direct you to a good google search or the abundance of YouTube video's. There is no other source of CFC's rather than human production. So when the relationship between these chemicals and the depletion of ozone was proven, it was hard to discard the research. Surely producers and other critics tried to maintain productions with claims such as "ozone levels always fluctuated naturally by place and season" or "The stratosphere is difficult to measure, you can't be sure". Eventually British scientists of the British Antarctic Survey managed to propose crucial evidence of the depletion of the ozone layer near the antarctic and made it an undeniable fact. You can find more about these findings here. This led to the general acceptance of the theory and a first Vienna Convention was signed by 20 nations and eventually the Montreal Protocol was established, a first ever international agreement on chemical pollutants. When we look at the discussion of greenhouse gasses causing global warming, we find the same but more exaggerated. On the planet there are already strong fluxes of greenhouse gasses and fluctuations of these concentrations by season, century, epoch... Critics of the theory and stakeholders in production causing emission therefor have more matter to back their point of view and keep the hypothesis from general acceptance. 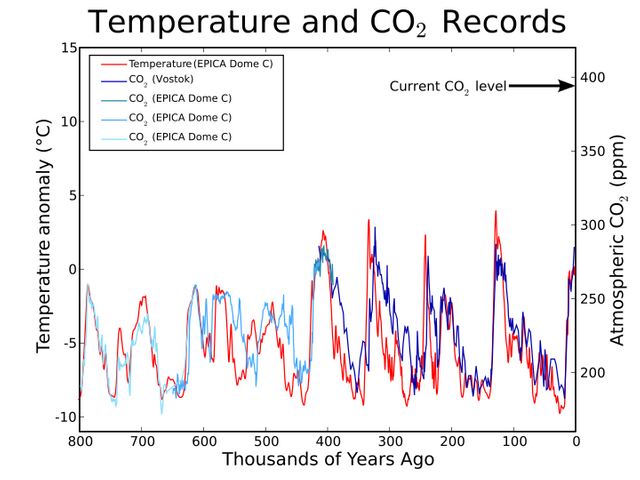 Graph showing natural CO2 fluctuations (one of the common greenhouse gasses) and current CO2 level based on different ice cores. Made with python by Leland McInnes under share alike 3.0 licence. It's nice to see how it is made. You can find the python code here. Surely more and more evidence is being delivered in favor of the theory that greenhouse gasses alter/warm the earth's climate and acceptance becomes more common, albeit at a slower pace than in the case of CFC's causing ozone depletion. CFC's were commonly used in situations were an inert, non-toxic, undetectable gas was required such as in propellant of hairsprays, refrigerant in air conditioning/refrigerators or foaming agents. When a ban was placed on these chemicals, an entire market appeared in the creation of alternatives, with success! The availability caused CFC's to get abandoned and it was as easy as swapping from making refrigerators with CFC's to making refrigerators without CFC's. In the case of greenhouse gasses it is not as simple as switching to "fuel that doesn't emit CO2". Greenhouse gasses are interwoven in so many production processes that we need more than just a few newly invented production methods. We do see a strong growth in the market for alternatives, such as solar, wind and geothermal energy but this market (1) cannot entirely absorb the need for CO2 reduction and (2) is by far not as big compared to other energy markets. Also taking only energy into account as producer of greenhouse gasses overlooks the strong impact of other factors such as agricultural activity (15%), transportation, (14%) cement production (10%), land use changes (10%) and many more causes. Although the current discussion about climate change is similar to the discussion a few decades ago, some key differences make sure fixing it will take a different approach. It is clear that policy makers learned from the ozone case. The Paris agreement, the things that comes closest to an international agreement, has very similarities to the Montreal Protocol in terms of structure and flexibility for future research. Wouldn't it be nice if we could make future generations look back at climate change as we look back at the ozone layer today? Do you have opinions/extra information/questions on this topic? Please leave it in the comments! I'd love to hear about it. ps. I have used both greenhouse gas and CO2 in this posts in the same context while there should be made a clear distinction. Greenhouse gasses are a broader term and contain other gasses contributing to global warming such as methane, nitrous oxide, and even water vapor. They are measured and communicated by IPCC with "CO2-equivalents" But when CO2 is used in this article, most of the times it deals about an example. Country roads... take me home... to the place.. I belong! The post deserves more attention than it has received, I think. You make a clear point by pointing out the complex differences (technical and economic) between CFC reform and CO2 reform. This is also a different time--I think we're in the midst of a cultural war and environmental issues have been caught up in that. Thanks for the thumbs up! (sorry for late response, I was on vacation). That is indeed true, times are very different, although the CFC problem also didn't arose in ideal conditions for such changes. But the cultural difficulties and embeddedness of CO2 producing systems are a whole other level of difficult. Such a great blog--and with all the rollbacks in the US today (in environmental protections), a necessary blog. I appreciate your response. Keep spreading the word. It's important.